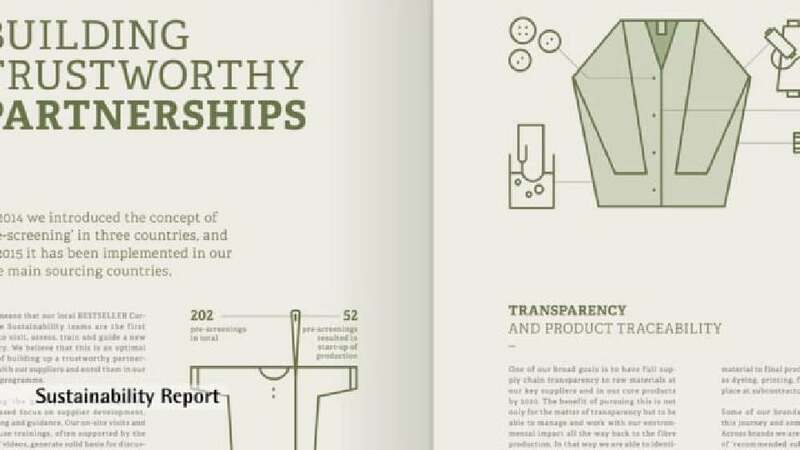 The design of the 2015 sustainability report for the Danish fashion company BESTSELLER focuses on visualising corporate social responsibility as a deeply integrated part of the company’s business operations. Creating a meaningful link between the communication of this engagement and the reporting from the core business fields, the design is inspired by the simple look of icons on care instruction labels hidden in the clothes. These icons were turned into infographics that, at the same time, form a visual bridge to the garments and fashion objects of the company. Throughout the report, they are used to translate abstract figures and data into easy-to-understand, visual messages. Furthermore, they are used to highlight important facts including key figures, percentage distributions and advancements. Last but not least, they also feature in a motion graphics film, which was produced in parallel with the sustainability report, and where they convey highlights from the report. The design of the BESTSELLER sustainability report 2015 suits the fashion brand perfectly. The figures are presented to appealing effect, fascinatingly complemented by careful image selection and refined use of pictograms. The concept is overall convincing and the choice of paper is also ideally suited to a sustainability report. Its well-balanced colours are pleasing to the eye.